I made these donuts yesterday for my son, since he was out of school, because of all the Georgia ice we are getting. I was surprised how much he loved them, since they were Vegan. He ate three donuts in one sitting. My biggest surprise was how much my husband loved these donuts. He even asked, when he got home after work, Are all the donuts gone? Yes!! Victory!! He is my picky eater when he comes down to vegan and gluten free foods, but he loved these. I hope your family will enjoy this recipe as much as my family has. To make the doughnuts. Preheat your oven to 350 degrees and grease your doughnut pan. Combine the flours and starches, organic cane sugar, baking powder, baking soda, cinnamon and salt in a bowl, mixing well. In another bowl add applesauce. In a sauté pan add milk and coconut oil, on low heat. You want to just melt the oil. Whisk the oil and milk until the coconut oil is melted. Add the warm mixture to the bowl of applesauce. Add vanilla extract and whisk. Pour the wet mixture into the dry ingredients and stir with a large wooden spoon until just combined, being careful not to over mix. You just want to mix until the flour is incorporated completely. Spoon the batter into the doughnut molds, filling to just below the top of each mold, 1/8 to 1/4 inch from the top. Bake for about 20 minutes ( depending on your stove it may take less time or more) until lightly golden brown around the edges. Use a toothpick to insert in the center of the donuts, the toothpick should come out clean. Let cool in the pan for 5 minutes. Slide a thin spatula or butter knife around the edges of the doughnuts to help loosen them out. After donuts have cooled, place on a cooling rack and allow to cool fully before topping. To make the glaze. Mix the ingredients together until smooth. Invert doughnuts into the coating, letting the excess drip off on a cool rack or drizzle over the doughnuts. I also made a Cinnamon Sugar to sprinkle on the donuts after the glaze has been applied. Very optional, but delicious. I love sweet potatoes. They are amazing for your skin and an overall wellbeing. They are packed out with Vitamin A, B6, C, D and also they contain iron, which is important in helping us produce red and white blood cells, keep our immunity going strong and help us to metabolize proteins. They are also high in carotenoids, like beta carotene, which is the precursor to vitamin A in your body. Carotenoids are powerful antioxidants that can help prevent cancer and protect against the effects of aging. Hey owning a natural and organic skin care company, that is a plus for me to eat sweet potatoes. lol. Last night I made my family their favorite, Sweet Potato Soufflé, some people call it Sweet Potato Pound, but mine is so light and fluffy my husband calls it a soufflé. I did a new spin on my original recipe. I made it Vegan. I did not tell my family until after they ate it. My husband was so surprised and said, “Honey I like this version better.” SCORE!! My diet is 90% vegetarian, vegan and raw. I am still working on my boys, but little by little they are coming around. They ate almost the whole pot. I went to look in the fridge and noticed there was only about a cup and a half of Sweet Potato Soufflé left, it gave me an idea; Sweet Potato Pecan Cranberry Pancakes for breakfast! This is a throw together recipe but I think this is what I did to create these yummy Vegan pancakes. I hope you enjoy them as much as I did. This will be my second Vegan recipe I will try on my boys next week. LOL. Bring a large pot of water to a boil. Add potatoes and cook until tender, 20 to 30 minutes. With an electric mixer on low, blend potatoes, slowly adding milk, about 1/2 a cup at a time. Use more or less to achieve desired texture. Add coconut oil and honey or maple syrup to taste. Blend until smooth. Serve warm. In a large bowl combine the sweet potatoes, floured oats, cranberries, pecans and salt until well incorporated. Add the remaining gluten free oats and stir. This should give the pancakes a nice oat coating. If you need more oats just add a little at a time until you get the desire consistency. In a sauté pan add the coconut oil to a medium heat. Shape the mixture into the desired size of pancakes you would like. Add to the oil and cook until golden brown on each side. Mines took about 2-3 minutes on each side. Plate and drizzle with a little honey or maple syrup. Enjoy and Remember no matter what your table looks like Set it with Love. My husband loves Banana Nut Bread and so do I . Every week I buy him organic bananas for his snack. This week he did not eat them for a snack, so mama had to make some banana nut bread for us. I love this recipe because the ripe bananas makes it sweet and I only used 1/4 cup of brown sugar. You can see from the pictures, I like it rustic. It’s not pretty, but delicious. 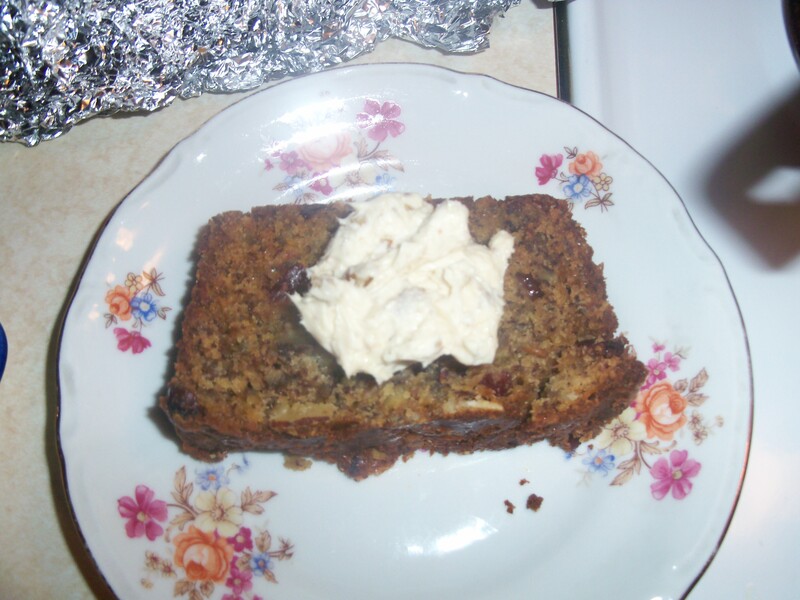 My rustic GF Banana Nut Bread. Preheat the oven to 350ºF. Line a 9-inch loaf pan with a piece of parchment paper. In a mixing bowl, beat the mashed bananas with the eggs, oil and brown sugar till combined. Add the sorghum flour, tapioca starch, baking powder, xanthan gum, baking soda, salt, vanilla and cinnamon and beat until a smooth sticky batter forms. Stir in the walnut pieces by hand, save a few to nestle into the top of the bread. Spoon the batter into the loaf pan and spread evenly, if you like. I gently spread mines because I wanted that rustic bread look. Nestle into the top some extra walnut pieces. Bake on the center rack for 55-60 minutes, if necessary, depending on your oven, until the center is done. Use a wood kabob stick or like my mama use to do, poke a knife down the center, gently. If it comes back clean, it’s a done deal. Ovens vary, so check the loaf at 50-60 minutes. My bread baked for an hour in my Whirlpool. Well I rested for awhile until I was craving this amazing bagel from Einstein Brothers. They call it the Power Bagel. It is packed out with whole grains, seeds, nuts and dried fruit. I call it one of my favorites when I need some tasty protein. But since I am resting and doe not want to give Einstein 3.29 that is including the honey almond cream cheese, I will make my own. So, I got out of my pantry some seeds, nuts, dried fruit and went to town. What did I come up with this little recipe. My High Octane Banana Nut Bread. Okay this bread is packed out with EFAs, essential fatty acids, protein, high in fiber, antioxidants, potassium, magnesium, vitamin C just to name a few. I also made a pecan honey cream cheese to go over top it, now this is not healthy, but boy was it good. Hope you will enjoy this Goodness on a plate. If you like your bread to have more seeds and nuts you can add a little more, but this recipe will fill your bread up with enough of each ingredient. Preheat the oven to 350 degrees F and put a rack on the middle shelf. Butter and flour a 9 by 5 by 3-inch loaf pan. In a separate small bowl, mash the bananas with a wooden spoon, you want to nice texture not real mushy. In another large bowl, use a hand electric mixer or stand mixer to cream the 1/2 cup of butter and sugar together until light and fluffy. Add the eggs, 1 at a time. Stir in the mashed bananas, sour cream and vanilla and beat until just combined. Add the dry ingredients and gently stir in pecans, almonds, seeds, cranberries. Pour the batter into the pan and put on a sheet tray. Bake for 1 hour and 10 minutes. Let cool for 5 minutes in the pan then turn out onto a wire rack to finish cooling. Slice and spread pecan honey cream cheese on top (optional). Mix all the ingredients in a bowl and serve over top your bread.